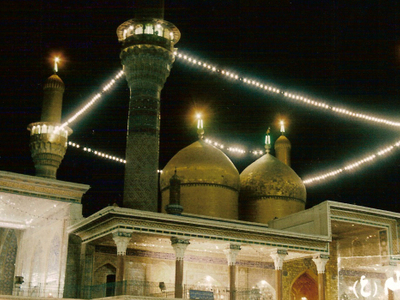 The Al-Kādhimiya Mosque is a shrine located in the Kādhimayn suburb of Baghdad, Iraq. It contains the tombs of the seventh Twelver Shī‘ah Imām Mūsā al-Kādhim and the ninth Twelver Shī‘ah Imām Muhammad at-Taqī. Also buried within this mosque are the famous historical scholars, Shaykh Mufīd and Shaykh Nasīr ad-Dīn Tūsi. Directly adjacent to the mosque are two smaller shrines, belonging to the brothers who compiled Nahjul Balagha - Shaykh Radhi and Shaykh Murtadhā. Repairs to the crumbling structure of the main courtyard of the mosque and its surrounding rooms were carried out in three phases, spanning a period of four months, before the end of 2007. The project entailed the stripping off of the old crumbling walls throughout the courtyard, the addition of various reinforcements to the walls and ceilings, as well as maintenance on the electrical wirings throughout the mosque. Once the inner structure was completed, the floors and walls were then plated in various kinds of marble. Updates to the cooling units of the mosque began in late 2008, and new water filtration units were installed on November 28, 2008. Among the earliest of repairs done to the mosque after the fall of the regime of Saddam Hussein, were repairs done to one of the entrance gates of the mosque known as Bāb al-Qiblah. The gate and the outer wall had to be entirely refurbished due to the severe neglect they had withstood, and took seven months to complete, having started in early September 2006. Here's the our members favorite photos of "Tombs in Baghdad". Upload your photo of Al-Kadhimiya Mosque! Adam Jebrin is the only Touristlink member to visit Al-Kadhimiya Mosque. Have you been here? Click here to save it.